Microsoft's rambunctious CEO, Steve Ballmer, is set to unveil a Hewlett Packard manufactured tablet (or 'slate') PC this week. The news comes direct from unnamed sources in a New York Times report — in which reporter Ashlee Vance notes: "My sources say that Mr. Ballmer will show the as yet unnamed HP device. 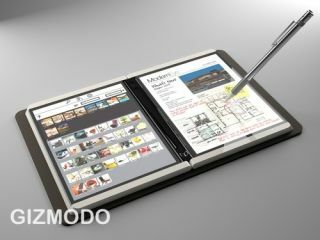 The product will be touted as a multi-media whiz with e-reader and multi-touch functions." The New York Times states that the new HP/Windows tablet computer announcement will be one of the highlights of Mr Ballmer's keynote speech at the 2010 Consumer Electronics Show in Las Vegas. The latest report in this week's New York Times warns that: "It could be one of Steve Ballmer's riskiest trade show moves in years…the last thing Mr. Ballmer wants to hold up is a me-too device. "All eyes will be on Mr. Ballmer this week to see if Microsoft and H.P. can out-Apple Apple before Apple Apples."